Helle was a mortal princess in Greek mythology, and one who appears in the scene setting for the adventures of Jason and the Argonauts. Helle was born in Boeotia, for Helle was the daughter of King Athamas and his first wife, the cloud nymph, Nephele. Thus, Helle was sister to a brother named Phrixus. Athamas and Nephele did not stay wed for long and Helle, and Phrixus, would find that they had a stepmother, for Athamas now married Ino, a daughter of Cadmus and Harmonia. Ino had no love for her stepchildren though, and having born Athamas two sons, Learchus and Melicertes, Ino sought to do away with Helle and her brother. The plot against Helle and Phrixus was a devious one, for first Ino arranged for the crop seeds to be parched, ensuring that the following year’s wheat crop did not grow. This caused Boeotia to fall into famine. Athamas would send forth a herald to ask the oracle at Delphi how the famine might be alleviated, but Ino had already bribed the herald, so Athamas did not come back with the word of the oracle, but instead uttered the words that Ino wanted him to say. Thus Athamas was told that the land would only be rid of the famine if he were to sacrifice Phrixus to Zeus. Now the sacrifice of one’s own child was not unknown in the tales of Greek mythology, for later Agamemnon would have to sacrifice Iphigenia in the build up to the Trojan War; and pressure was placed upon Athamas by his own subjects. ​Events in Boeotia had not gone unnoticed by Nephele, and just as Phrixus was due to be sacrificed Nephele enacted a plan to save both Phrixus and Helle. Nephele would dispatch Crius Chrysomallus, the golden ram offspring of Poseidon, to Boeotia. The Golden Ram had many magical abilities, including the ability to talk and to fly; and soon the Golden Ram, with Helle and Phrixus upon its back, was flying from Boeotia, leaving the devious Ino far behind. The destination for Helle and Phrixus was Colchis, but it was a long flight from Boeotia, and Helle was not as strong as Phrixus, and soon the daughter of Athamas was having difficulty hanging on. 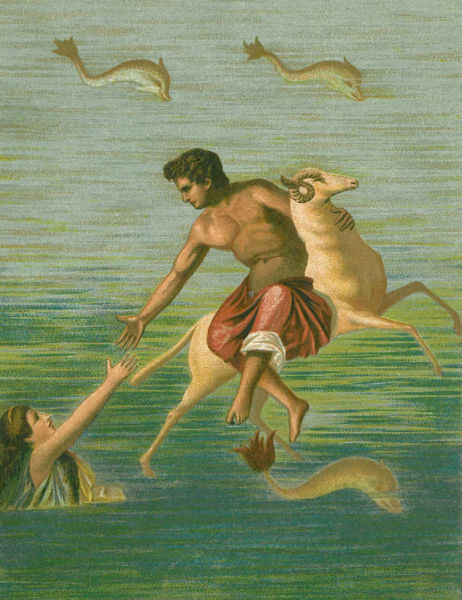 At a point between Sigeium and Chersonesus, Helle finally lost her grip upon the fleece of the Golden Ram and plunged into the sea; a fall which is normally said to have killed Helle. The place where Helle fell to her death would be known as the Hellespont, and was the name associated with the narrow strait of water between the Sea of Marmara and the Aegean. Even today, the name Hellespont is still used by some, but that strait of water is better known as the Dardanelles, although even this name has its roots in Greek mythology, for it comes from Dardanus, the name of a city and king of the Troad. Some say that Helle did not die having entered the water, but was instead transformed into a minor sea goddess by Poseidon. Later, Poseidon would lay with Helle, who bore the Olympian sea god two sons, the giants Almops and Paeon.